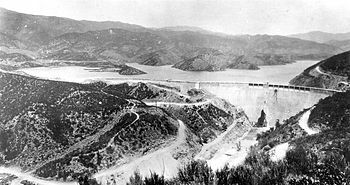 The March 12, 1928 failure of the "Saint Francis Dam" in northern Los Angeles County in Southern California was one of the worst "natural" disasters in U.S. history and resulted in the second greatest loss of life (about 450 lives). Only the 1906 San Francisco Earthquake and its associated fire claimed more lives. My coverage of the St. Francis Dam is "broken" into two parts. This first part concerns the physical aspects of the dam, and the second part (the next post) concerns the geology of the site. This photograph (from Wikipedia.com) shows the completed dam in 1928, which was built in 1924 through 1926. The view is to the northeast. The dam was 185 ft. high (56 m). The length of the main dam was 700 ft. (210 m), and the length of the wing, on the west side of the dam, was 588 ft. (179 m). The reservoir was 3 mi. long, and the maximum water depth was 182 ft (55 m). The reservoir was at full capacity (38,000 acre-feet), just before the dam collapsed. This photograph, upstream view, (also from Wikipedia.com) shows the remnants of the dam after its collapse on March 12, 1928. Only the central part and most of the wing dike (on the west side of the dam) remained intact. 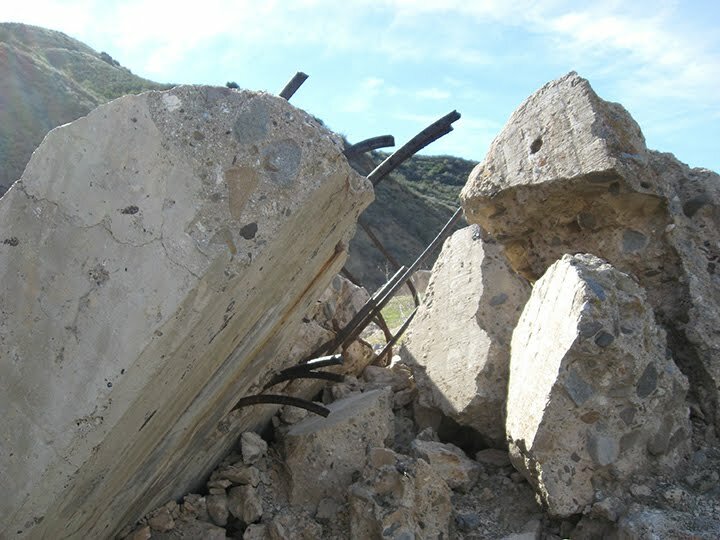 This dam, which was part of the Los Angeles Aqueduct system, collapsed just before midnight. The wall of water was initially 125 feet high, and its initial velocity was 18 mph. The 12 billion gallons of water roared down the Santa Clara River Valley to the city of Ventura, which is at the coast. The water traveled a total of 55 miles, and it took 5.5 hours to reach the ocean. The debris was a deadly mixture of mud, barbed wire, wood, etc. Nearly all the victims never knew what hit them. All the subsequent photographs (in both of the posts) were taken by me in January, 2011 and in April, 2017. This is all that is remains today of the main part of the dam. 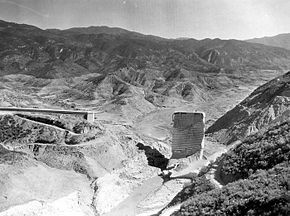 Although the central part did not collapse during the failure of the dam (see first picture), it was eventually dynamited in order to prevent climbers from attempting to climb it and possibly fall (i.e., liability issues). Remnants of the "steps"which were on the downstream part of the face of the dam. Rebar sticking out of large chunks of the concrete rubble. The staff is 1.5 m (in 10 cm increments). The flat surfaces were once part of the "steps," mentioned above. Other sides of the same blocks shown in previous slide. Piece of cable which was added to the concrete mixture. The concrete consisted of large angular chunks of cobbles and boulders of local rock types, including the Pelona Schist (e.g., gray angular piece in lower left side of picture, next to the cable). This is the floodplain about 0.25 mi. downstream from the dam site. As you can see, there are building-size chunks of the dam that were broken up and transported by the wall of water suddenly being released from the reservoir behind the failed dam. Most of these chunks, some weighing as much as 10,000 tons came from the western side of the dam. Most of the eastern side collapsed in place and remained near the dam. Some of the transported chunks moved as far as 3,000 ft. downstream. For scale: Notice the cars on new highway along the left side of picture. San Francisquito Creek once again flows freely, right through the middle of the collapsed dam.